Introduction. Part One: Monolithic Arrays Detector elements and read-out means are provided in the same semiconductor body. Charge coupled device imagers. Ambipolar drift field imagers. Static induction transistor imagers. Charge injection device imagers. Charge imaging matrices. Part Two: Hybrid Arrays Detector elements and read-out means are provided in separate semiconductor bodies. Detector arrays with individual detector element read-out leads. Detector elements are provided with individual read-out leads formed in or on a non-active supporting substrate. Detector arrays without individual detector element read-out leads. Individual detector elements are provided with bump connectors or with no connectors at all. - Cross-talk preventing measures - Passivation and leakage current preventing measures. Flip-chip arrangements - Thermal stress preventing measures. Z-Technology arrangements. Detector arrays directly contacting the read-out chip - Connections made by through hole technologies. Patents number index. Inventor index. Company index. Subject index. 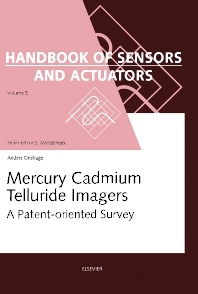 In two parts, this book describes the evolution of mercury cadmium telluride (HgCdTe) imager structures based upon published patents and patent applications. The first part covers monolithic arrays, and the second part describes hybrid arrays. Each part has 5 chapters, with each document placed in chronological order, with the documents with the earliest priority placed first. Focus has been directed at the steps of manufacturing and structures of imagers. There is an index at the end of the book containing the patent number, the name of the applicant and the date of publication of each cited document. This monograph will serve as a useful summary of the patents and patent applications in the field of mercury cadmium telluride imagers.